The Western Electrical Contractors Association and its apprentices always appreciate donations of lab materials from members and industry vendors. Check out the scoreboard below to see who's winning for most lab donations this year. 17-18 Donation Scoreboard--congratulations to winner Platt Electric Supply! 16-17 Donation Scoreboard archive--congratulations to winner Ideal Industries! 15-16 Donation Scoreboard archive--congratulations to winner Milwaukee Tool! 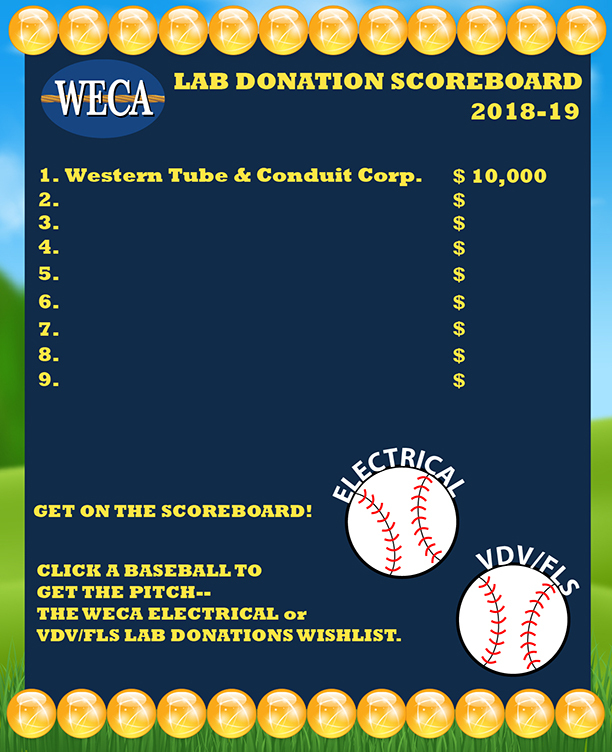 14-15 Donation Scoreboard archive--congratulations to winner Western Tube and Conduit Corp! 13-14 Donation Scoreboard archive-- congratulations to winner American Internet Services (AIS)! 12-13 Donation Scoreboard archive-- congratulations to winner Graybar/Square D!